Assistant Secretary General of the United Nations and Assistant Administrator and Director of the United Nations Development Programme (UNDP) and Regional Bureau for Asia and the Pacific, Mr Haoliang Xu called on President Mahinda Rajapaksa at Temple Trees this evening on 12 February. UN Assistant Secretary General, Haoliang Xu during the discussion with President Rajapaksa commended the progress achieved by Sri Lanka after the end of the conflict. The President explained the measures so far taken by the government to resolve problems faced by the people of the North and to develop and rebuild the area. Minister of Education Bandula Gunawardena, Secretary to the President Lalith Weeratunga, Secretary of the Ministry of External Affairs, Kshenuka Senevirathna and Director General- United Nations at the Ministry of External Affairs, M.R.K. Lenagala were also present on the occasion. Earlier the United Nations Assistant Secretary General Haoliang Xu who is on a visit to Sri Lanka, undertook an inspection tour to Mullaitivu before he called on the President. The UN diplomat also joined in the opening of the Ice Plant built in Mullaitivu with the financial assistance from the UNDP for the benefit of around 5000 families who are engaged in the fishing industry. Mr Haoliang Xu seized the opportunity to discuss the development and civilian life in the area with Mullaitivu District Secretary N. Vethanayagam and government officials. Sri Lankan Chief of the United Nations Development Programme Rashina Bilgram and Members representing 66 Fisheries Societies in the Mullaitivu District were among those present on the occasion. 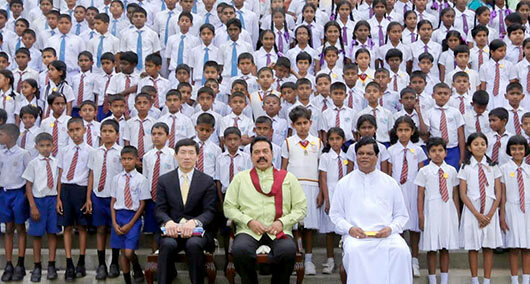 Before the discussion Mr. Haoliang posed for a photograph with the President and a large group of school children who were there to see Temple Trees. 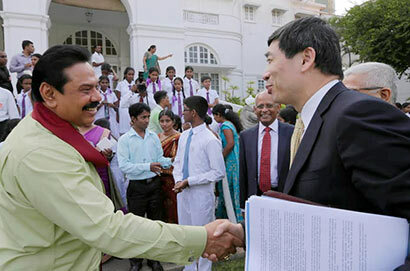 President Rajapaksa is also seen here receiving the visiting UN Assistant Secretary General, Haoliang Xu at Temple Trees.